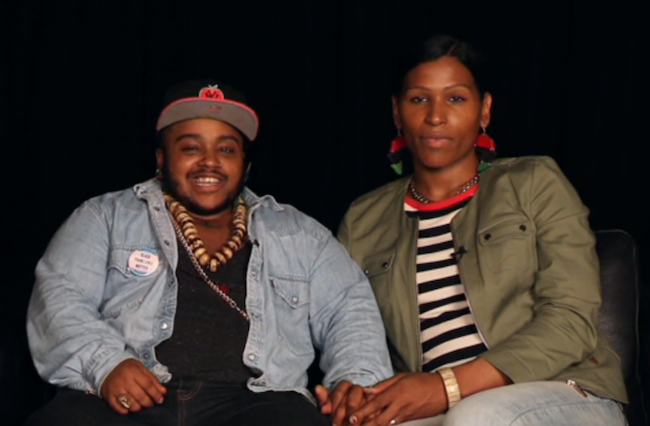 NBCBLK, NBC's online space that focuses on the stories, news, and culture of the contemporary Black experience in America, has created a video series titled #blkOUT, which documents the stories and issues of queer and trans Black people today. In the following video, three couples open up about their relationships and the revolutionary beauty of being in love with and/or as a trans person. While Caitlyn Jenner received national attention—much of it positive—earlier this month, when she officially debuted her new identity as a trans woman on the cover of Vanity Fair magazine, trans people of color still continue to face discrimination and marginalization. Notable trans celebrities and activists like Janet Mock and Laverne Cox have spoken about the issues that trans people of color face. Often, marginalization and discrimination stems from people being unwilling to see trans people as fully human, and thus deserving of love, intimacy, and companionship. The three couples in the video challenge this narrative, sharing insights about their relationships and celebrating their partners. Ultimately, they provide heartwarming examples of partnership, mutual respect, and devotion that all of us, regardless of sexual or gender identity, can learn from.